Pull out your collection of loose recipes you’ve gotten from friends, family, or magazines. Decide which recipes to put in your binder—those that will help you accomplish your health goals and are tried-and-true favorites. Categorize your recipes into groupings that make sense to you. You could categorize by main ingredient, such as chicken, vegetarian, or beef; or you could categorize by type of dish (main dish, side dish), or meal (breakfast, lunch, dinner). Simply choose categories that make sense to you. 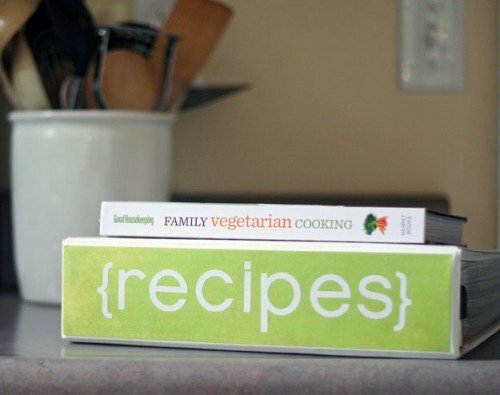 Label binder tabs with your categories, and then slide your recipes into sheet protectors to keep your recipes free from spills and other midstream cooking messes. Use the front pocket of your binder (or add a pocket folder) to stash recipes you’d like to try. This is the fun part. Won’t it be great to have quick and easy access to all your favorite healthy recipes? When you’re making your grocery list, pull out your binder and make a list of upcoming meals and recipes to prepare. Add the ingredients to your list shopping list and you’re good to go! Organizing two-for-one accomplished! What’s your favorite way to organize recipes? I’d love to read about it in the comments below! P.S. If you’re ready to start your journey to a life free from paper clutter and the stress it creates, hurry on in to my Organize Your Paper Clutter online class. This self-paced online class shows you how to organize every type of paper in your home, eliminate clutter, stress and worry. One thing any paper system lacks, though, is the ability to search. So, one of my “to-do list bingo” tasks (thanks, Janine!) is to upload recipes into my recipe box at my favorite recipe website. That way, I can use their search engine features on my personal collection as well as theirs, making it easier to find recipes that fit my time or the ingredients at hand. Thanks for your comment Linda. Great ideas! And I’m so excited that you’re using Janine’s to-do list bingo system!